Great stuff as always, Michuru. That Santa Claus rocks. I may have to "homage" that. Height / Weight: 5'9" / 145 lbs. Biography: Evangeline Carlson was an American who felt the best way to spend the summer between her high school and college years was to backpack across Europe. It was in her travels that she met a man, a suave and charming rogue of a man who stole her heart and made passionate love to her one night in France. The next morning he was gone... but he had left her with his seed. Twin boys were conceived that night- Evangeline learned of them not long after. The pregnancy preceded disturbing fast- with her going into labor not three months after meeting the children's father. She gave birth to her sons in Gloucestershire, England and told her tale to the doctor; the man hadn't believed her farfetched story until he delivered the twin brothers- each with burning black eyes. Believing them to be spawns of the devil, the man plotted to drown the brothers in the spas the town was famous for. Learning of the plot, Evangeline took the boys and fled to Bishop's Cleeve where she met a priest who helped her flee the wrath of the people the respected doctor had gathered. Still, the two were separated- Evangeline escaping with one of the children while the other was still in the hands of Father Anthony. NEW VINDICATORS: Sic Semper Tyrannis – The other boy was named Jeffrey and raised by the priest who had helped his mother to flee the villagers. Raised in England, Phobos’s hellfire array is very similar to his brother’s- albeit the pair summon two vastly different soul weapons. While Deimos summons a scythe, Phobos calls a lance and shield into being. Ultimately, the two met during the Trials and clashed many times throughout. It was their rivalry which nearly cost Lodestone’s group the game many times: the brothers ignored all else to battle in the First Trial and Phobos’ team attempted to bar Lodestone’s from finishing the Second Trial. One of Phobos’ teammates (Contagion) was able to inflict each member with tuberculosis during their battle and the disease made them easy prey for Team Australia in the Fourth Trial. Finally, in the Fifth Trial the brothers collided in a one-on-one fight. Deimos’ emotions raged out of control there and when he began to become a hellfire beast it was Phobos who single-handedly defeated him. Phobos assaulted Deimos and revealed that while Deimos had manifested a Neo-Sapien ability to create darkness, Phobos had gained the ability to create and detach multiple arms. Height / Weight: 5’4” / 136 lbs. Biography: Jean Genis was always teased for being different. He was always more intelligent than his peers- and exclusion is often the price paid for intellect. Jean had a secret though… he was an Esper, a fact he had known for some time. He was blessed with the ability to know what those around him know- duplicating their mind with a simple touch. Throughout his adolescence, Jean blackmailed those around him with what he could learn. Bullies were terrified to pick on the youth, for fear of what new dark secret he could reveal about them. As he grew, so did his powers. A fraction of what he garnished from those around him remained, enhancing his mental capacities and their ability to process information. Eventually, he put his big brain to use in a life of crime- orchestrating a crime wave and manipulating villains into becoming a giant smokescreen. He was discovered and defeated by the Vindicators. NEW VINDICATORS: Radix Malorum Est Cupiditas – Eventually he found himself in Alcatraz- up until the jailbreak saw him back on the streets. With no real way of defending himself- he opted to merely hide. His mind told him there was no place better to hide than the most populated city in America. Unfortunately this put him in New York City during the Affiliation’s debut assault. Injured in the nearby explosion of Halogen’s home, he was taken to the hospital in police custody where the New Vindicators arrived with their wounded. A racist doctor’s refusal to operate on Tripper gave Bookworm the opportunity he needed- siphoning the doctor’s intellect and saving her in exchange for Anomaly helping him become a freeman. NEW VINDICATORS: Absit Omen – Oddly enough, the Department of SPB Affairs agreed. Silverback had been paroled for his good behavior during Justice’s raid on the prison. Bookworm had escaped and then attempted to bargain for his freedom. His presence at the school made no sense to Coach Crag; after investigating further, the headmaster learned that Bookworm had been brainwashed and made an agent of Operation: Black Box. Following the assassination of Senator Bedford, the New Vindicators Academy was raided by Operation: Black Box. Although Bookworm was taken away by the Sentry, he was not seen amongst those deposited in the concentration camps. Michuru81 wrote: I'm of the opinion that not every super-powered villain who comes along has the power it takes to bring the PCs to their knees. Still, they have a power and they find a way to make it work. Bookworm is more of a behind-the-scenes villain. With some Equipment and Minions, he becomes more of an annoyance. As my PCs begin to deal more with Operation: Black Box, they're discovering that a favorite tactic the organization uses is in brainwashing their friends, family and enemies- leaving the newly made puppet with their immunity to interaction skills. Height / Weight: 5’6” / 121 lbs. Biography: Having not been enrolled at the New Vindicators Academy during the Massacre, the young emo found himself oddly calm during Terahertz’s attack. He was instrumental in taking down Scrimshaw and was promoted to the New Vindicators. NEW VINDICATORS: Para Bellum – The Damned found himself spirited away from the school by the Aurelius, along with Adrianna Covington and Josh Cron. Taken to the New Vindicators Academy of Europe, the young heroes were trained in the arcane arts- which the Damned showed himself to be very talented with. In half the time it took the other students to master their first spell, the Damned had learned five. The Aurelius wanted to embrace him as his new apprentice, but the Damned showed no excitement for his new found abilities. The Damned has no Defense and no Toughness (outside of what the uniform gives him). He welcomes death and pain. It's... kind of creepy. At least it gives him a major glass jaw like any true magus. As per usual, our mages' spells are inspired by our D&D roots and one of the biggest helps we've had has been Prodigy Duck's conversion thread which... everyone should be drooling over. It's blindafficly awesome. Height / Weight: 5’8” / 145 lbs. Biography: It was a hot day in sunny San Francisco the day Joshua Cron’s Neo-Sapien powers first manifested. The family’s station wagon had died along a major artery on the California highway. Cars blazed past their father as he gazed under the hood. Their mother wouldn’t let them out of the car and her temper was reaching its boiling point, fed up with Josh’s tattling on his elder brother, Eli, and his shoulder jabs. Unable to roll down the power windows and without AC, Josh suddenly discovered his power to manipulate the air… and he used it to cool his family down. NEW VINDICATORS: Memento Mori – Josh’s flight allowed him to survive the Affiliation’s attack on the school. The following year, he was put into Magnus Loder’s telekinesis class, where he was forced to endure Alf Williams. NEW VINDICATORS: Para Bellum – Josh had been one of the few to realize the school had two prisoners kept in the Wreck Room when the Church of Genetic Purity attacked. Going to let him loose, he came upon the Aurelius and was teleported away to the European Academy. There, Josh began his life as an apprentice magician. The magic which chose him was the magic of divination- one which many deemed useless but one he believes makes him just a better hero. Michuru81 wrote: Another of Bob's PCs, Josh Cron is made to be intentionally laughable. Height / Weight: 5’11” / 163 lbs. Biography: Stephen White graduated third in his class from Harvard Medical and in no time was considered to be the greatest surgeon to ever grace the medical field. His success he shared with his fiancé, the heiress Elaine Browning. The two planned a long and happy life together, but life has a way of upsetting plans. Countless times his miracle-performing hands landed him in TIME magazine. The last time he graced the cover was a report of a different nature: fire had consumed his Manhattan apartment and his lover had been trapped within. Crawling inside a bottle, Doctor White retreated to his vacation home where he next saw Elaine. Panicked and screaming and pursued by some unearthly force, Elaine called out to him to save her before she vanished. He took the Browning fortune he had inherited and invested it into scouring the world for a way to commune with her again. Ultimately his searched seemed doomed until he met Claude Thornton- the Aurelius. Claude proceeded to tell Doctor White that they shared a common ancestor: the Aurelius, a man who in millennia long gone had penned a tome revealing the secrets of arcana to man. Any human could be taught to wield one school of magic, but only the Aurelius– one descended from the man who wrote the Book of the Grigori –could hope to channel multiple energies. In his training as the Apprentice, Doctor White was reunited with Elaine, being hunted by a being known only as Asmodeus. “He wants to use me to get to you,” Elaine said. “He wants you to get to your unborn child. Elaine told him to move on and to forget about her. In time, he did move on… but he never forgot. Claude passed on and the mantle of the Aurelius was passed to Stephen. Years later, following the disappearance of the Vindicators V, the Aurelius began to search out others to replace them. He gathered Lodestone (III), Onyx, Nock, Halogen and Phenomena under him. Over time the Aurelius and Phenomena began a relationship, marrying and bringing a baby girl, Atlanta, into the world. Together, the Vindicators fought many battles and overcame many difficult challenges. Ultimately the greatest opponent they fought was each other; their differences and personal problems pulled the team apart and Stephen and Clementine White separated. ILLUMINATI: Wild Hunt – Abaddon learned of the existence of the Anathema Ring and personally laid siege to the Chapel in an effort to bring out the Aurelius. Knowing protecting the ring was the most important thing he could do, he disappeared- leaving his apprentice as the new Aurelius by default and causing Atlanta to inherit all that was his. Atlanta passed up her invitation to join the Vindicators to led the Illuminati in finding her father. Ultimately, their hunt brought them into conflict with Purgatory, a demon sent by Abaddon to find the Aurelius. The Illuminati fought the beast- only to be devoured by the void inside of it. NEW VINDICATORS: Absit Omen – Unbeknownst to many, the Aurelius had used his powers to secure a position at the New Vindicators Academy of America. He began teaching under the identity John Black and soon spotted Adrianna Covington, his apprentice’s half-sister. When the Church of Genetic Purity raided the school, the Aurelius dropped his guise and moved to protect the girl. He teleported her (and two other students with her) away from the battle. NEW VINDICATORS: Para Bellum – Taking the trio to the New Vindicators Academy of Europe, the Aurelius began to train Adrianna in arcana. Others joined in as well; Breeze, the Damned, Fey and the Rhino began to learn magic as well- though without the blood of the Aurelius they were only able to acquire one talent. While Breeze showed a talent for divination, Fey displayed great potential in evocation and conjuration seemed the domain for the Rhino. Though he had hoped Kitten would outshine them all it was the Damned’s natural aptitude for necromancy which left the Aurelius stunned. Height / Weight: 6’6” / 250 lbs. Biography: Nikoleivitch Volkov was a simple farmer who had only just buried his child bride. The Second World War was sweeping the world around him and he wasn’t sure what manner of being he was. He had discovered, only days earlier, that he could transform his flesh into metal. Fighting to find a purpose, he joined the Red Army and fought alongside his brothers, using his powers to spare him and his platoon any serious injury. Word soon spread of the man’s miraculous abilities and when Johann Meinstein declared the war would continue he was commanded to take the tyrant out. Working with four other SPBs from the other allied nations, the Iron Curtain became one of the founding members of the Vindicators and together they shared many adventures. The good times were not to last however: as the McCarthy era arrived, the Iron Curtain was investigated and discharged from the Vindicators as a suspected Communist. He returned to his homeland only to be put in a leadership possession over the newly formed Cold Warriors- a group of communist super-heroes. The group would clash against the new incarnation of the Vindicators several times before the two parties were forced to work together. However, that mission would be forever remembered as their last; neither team escaped and for a long time the Vindicators and the Cold Warriors were assumed dead. ILLUMINATI: Philanthropic Vengeance – In Berlin, the Illuminati teamed up with the Vindicators and learned that the Sixth Reich had discovered what had happened fifty years prior: a psionic entity had rewritten the heroes’ minds and they had all lived out the rest of their lives as normal civilians who knew nothing of their powers or the adventures they had once shared. NEW VINDICATORS: Absit Omen – The Iron Curtain joined the New Vindicators Academy of America (against the Asian institute’s wishes) and was put onto Hourglass’ squadron. He made friends quickly with Connor Crete and Christmas Clark and even began dating Jessica Martin. Despite the tragedy in his past, he seemed to be genuinely happy with his new direction. All of this was a ploy though as Abaddon had contacted the Iron Curtain with promises to restore his rightful age in exchange for his services inside the school. His identity as a traitor was eventually exposed in his battle with Bulwark. The hero was able to subdue the legend, leaving him behind in Colonel Sidell’s ruined apartment where he was picked up by Operation: Black Box. Michuru81 wrote: Yes, I'm aware that his Immovable and Super-Strength should be 4 instead of 5 and his Protection should be 6 instead of 12. They were paid for from the 150 points used in the build. Height / Weight: 5’2” / 128 lbs. In the end, time made Walkabout the lone surviving member of the third incarnation of Vindicators. NEW VINDICATORS: Sic Semper Tyrannis – When Firn opted not to act as the proctor for the Second Trial, Walkabout was given the honor instead. He used his abilities to send the young heroes around the globe and proceeded to gauge how well they handled a change in surroundings- as well as their ability to survive and respond. He was present when Lilith abducted Iris on behalf of the new Mister Mayhem and transported the faculty and graduates to Moksha. Remembering what he had done when the original Mister Mayhem struck, Walkabout blamed himself for this new turn of events and sought to rectify things: when Bastion the Fist launched the missiles once unleashed by the United States government in the 1970’s, Walkabout teleported the New Vindicators back to the school and sealed himself, the nation of Moksha and the missiles in a state of suspended animation. Height / Weight: 5’4” / 100 lbs. Biography: Not long after the new team of Vindicators had banded and beaten down the Order of Chaos, they responded to an emergency call from the Flathead Indian Reservation in Polson, Montana. There they found a ten-year-old girl separated from her body and being chased by monsters. As a Nephilim, Breanne’s mother had the power to permeate any surface. Those powers evolved in her daughter- letting her distort her own electro-magnetic field to transcend physicality. When the Vindicators couldn’t save her, they called on the Aurelius who, along with a 15-year-old Michuru Bradshaw, traversed to the Astral Plane and saved the girl from the Purgatory. Breanne was left there, now with some control over her ability to project her soul into the Astral Plane. However, two years later, the Order of Chaos infiltrated the Vindicators’ headquarters and using their mission logs attacked anyone the heroes had helped. Killing Breanne’s parents left the 12-year-old orphaned and left her wanting revenge. She used her powers to help those who had once helped her and, with nowhere else to go, was made the seventh member of the seventh incarnation of the Vindicators. One of the duties of the Vindicators VII was improving Neo-Sapien relations with the world. Rift grew up in the public eye, appearing on talk shows or whatever embarrassing PR the Department of SPB Affairs could think up. The only thing close to normal she had was a crush on her teammate, the one who had saved her when the Vindicators first came into her life. The five-year age difference didn’t matter to her; the only obstacle she saw was Bridget Hart, their teammate who Michuru was growing increasingly close to. While responding to Atlas’ latest threat, dubbed the Ragnarok, the heroes were separated. Rift began moving through the mountain walls, looking for anyone she could find. She found Chimera and Xianbei, two of her considerably older teammates. She overheard the married couple argue and learned that Chimera had been posing as Atlas and the Ragnarok had been a trap to kill his wife. With her last breath, Xianbei switched bodies with her husband- letting his spirit die in her body and allowing her to live on in his. After witnessing the gruesome, Rift pulled back and the new Chimera continued on- without knowing her teammate had seen their altercation. NEW VINDICATORS: Radix Malorum Est Cupiditas – After graduating from the school, Rift returned as an educator. She would be working alongside her former teammate (and crush) Michuru in teaching the students basic self-defense. Not long into the new school year, Rift responded to an emergency call and saved a young man from the Church of Genetic Purity. Adonis Skraag told her his story and how his parents had died for his sin: using his power to seduce his crush. Though he tried to tell her his powers couldn’t affect men, she believed Adonis the key to getting the man she wanted. Using the promise of what Adonis’ powers could give, Rift convinced Professor Incendiary, Doctor Splash and Pandora to help them. With Xianbei’s mind inhabiting Chimera, she knew Adonis could have no trouble giving the face-changer to Professor Incendiary. Miss Mist would be given to Doctor Splash and Halogen would be Pandora’s. Chimera she blackmailed into working with them as well. Slowly, Adonis turned her conspiracy to win over the affections of one man into an army he could use to fight the sort of prejudice the Church of Genetic Purity represented. Under his direction, the Affiliation took on a different shape than Rift had ever dreamt. NEW VINDICATORS: Absit Omen – She returned a year later and attempted to abduct Isaac Slade, a student at the school capable of inspiring emotion in any who heard him sing. She believed his powers could help her get what she had been after for so long, but Elemenoh’s appearance and the tenacity of the newest New Vindicators stopped her again. NEW VINDICATORS: Para Bellum – According to Hikari, in his timeline, Rift became one of the Synod- serving Apocatastasis for the promise of having Michuru not only returned from the dead but controlled and granted to her. 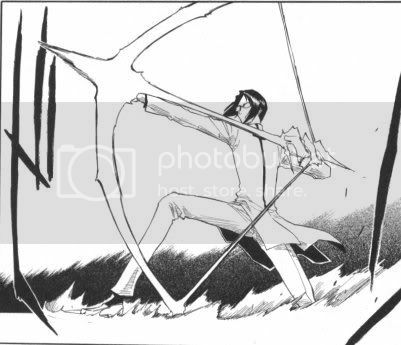 As a Quincy, Ishida has the power to draw spirit particles from their surroundings and form that into the quintessential bow and arrow they fight with. Further, this ability the Quincy possess is based on their own stamina- hence the flaw on his blast. Ishida’s skills and abilities should speak for themselves but I want to point out his Charisma. Keep in mind that Ishida is kind of a dark horse at school. He doesn’t really have friends. Most people are sort of weary to approach him. Factor in how horrible of a lie he feeds Rukia when he steps in to save her from Renji and Captain Kuchiki and you’ve got a kid who lacks people skills. Ishida is studied in hollows and shinigami, but his expertise fighting the hollows seems more practices whereas I get the feeling Ichigo is the first shinigami Ishida has met- hence the difference in ranks on the Favored Opponent feat. As for Ishida speaking Spanish, later on in the series he shows an understanding of the terms the Arancaar drop. It's doubtful he picked this up during the main storyline as he's always busy with something else (training with his glove, fighting through Soul Society, trying to get his powers back), thus insinuating that this was a previously acquired skill. 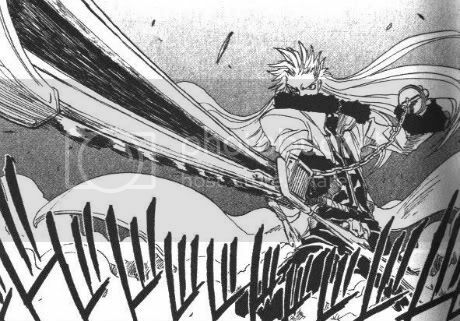 Michuru81 wrote: Akutabi Gamma is the main character of BLEACH creator Kubo Tite’s previous manga, Zombie Powder. 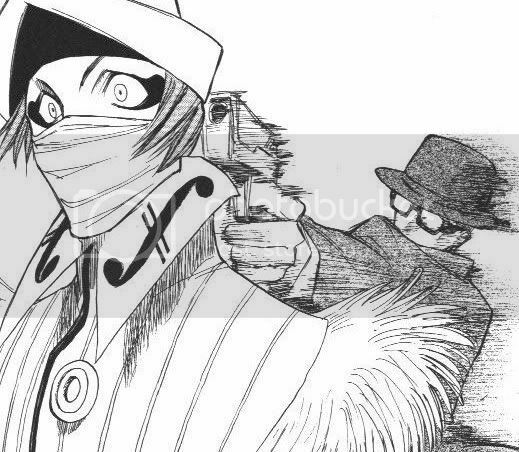 Initially, the story appears very similar to Trigun: Gamma is a mysterious man with an odd weapon; he has a price on his head and is considered a dangerous criminal despite that he’s really kind of a nice guy (this is a Kubo Tite book, so the main character HAS TO BE gruff and unapproachable). Like Kurosaki Ichigo (BLEACH), Gamma has a dark side he’s fighting to hold back. In Gamma’s case, this isn’t a hollow but another personality similar to Hitokiri Battousai (Rurouni Kenshin). Though the first few chapters focus on Gamma using his black arm and chainsword in battle this steadily changes… As Gamma finds himself facing off against Baragne Balmunk’s warped circus he begins to use Karin Zanjutsu more. In the ancient art’s two millennia-long history, only fifteen people have mastered up and are branded with the tattoo that denotes this. Naturally, Gamma is one of these rare people. More exceptional is that while it normally takes thirty-two years to master the art, Gamma has achieved such a feat in four years. This power is manifested in the form of black fire, though it’s shown to have little in common with fire other than its appearance. The flames are harmless to touch as Gamma sprouts several tentacles that he has Elwood and the prisoners he rescues from Calder cling onto them as he ascends through the floor. Later he demonstrates that the flames are solid enough to shelter the same prisoners from the collapsing ceiling. The first time this power is displayed is when the flames leap from Gamma’s body to attack Calder. The aura shoots off from him, at first taking the form of long appendages used to spear through enemies, scale heights, shaped to curve and slash through a cluster of foes or formed as a line that cleaves through Amantine’s massive arm. As he gives a unique name to each blast, I represent them as unique powers bought in his array. These effects are not constantly in effect though, as after his battle with Balmunk, Gamma reveals that using the power successively leaves him somewhat wobbly. I loves me some Bleach! Those are nice builds. Keep 'em coming! Height / Weight: 5’8” / 110 lbs. Biography: Youth, in all its bountiful optimism, translates to most young people believing that they are invincible. When she was sixteen-years-old, Tempest Kline imagined that in the next ten years she would have conquered the world. Never in her wildest dreams did she dream she would actually find herself saving it. Today, Tempest is twenty six and employed as a management consultant specializing in helping non-profit organizations utilize their full potential. Against all odds, she has managed to balance it with her dual identity- that of a single mother. Still, ever since the day she realized she was capable of moving objects with her mind, she has found a secondary purpose. No longer does Tempest Kline dream of conquering the world; she intends to leave it a better place for her daughter to dream of ruling instead. Michuru81 wrote: About this time last year I joined an M&M game run by one of my players and came into the campaign as Tempest Kline, telekinetic single mother and business consultant specializing in nonprofit organizations. In our first session, we were forced expose our abilities to fight off the arctic Apathy and her pet bengal tiger. This lead to Seeker bringing the four of us together and telling us about the impending doom about to befall the world that only we could prevent. Height / Weight: 6' / 153 lbs. Osmosis’ Audiolog, April 23, 1:37 AM: Today is the day William Shakespeare was born. Today is the day William Shakespeare died. I read once that in old times, the Jews believed that all true prophets of God would die on the day they were born. Was William Shakespeare a prophet of God? I doubt that but… hey, you never know? I’m sure there’s some religious whack-job out there pouring over his work, trying to find some secret code or theological allegory to it. Nobody appreciates a good story for what it is: a good story. Well, here’s my story. I hope it’s a good one. I taught myself to read when I was three years old. I don’t remember it. That’s a hard thing for me to say: “I don’t remember”. I remember everything. I remember what I was wearing on Thursday, May 27, 1999. I was wearing a pair of jeans and a black T-shirt with a white dress shirt over that. It was windy out and the wind kept throwing the shirt back so I buttoned it up as I crossed the empty school parking lot on my quest to ask Malia Kennedy out. I remember everything… but I don’t remember much from my childhood. I do remember the night I lost my leg though. There’s so much in this life that we take for granted, you know? For instance… glasses. Without my glasses, I can see maybe a foot in front of my face. After that, everything is just a distorted blur of color. I’ve worn glasses for as long as I can remember, meaning that… I’ve never actually seen this world with my own eyes. I’ve always needed help… So, if you don’t have to wear glasses, thank whatever god you worship every day and never take that gift for granted. I always took the use of my legs for granted. I remember being a kid- when summer vacation rolled around… I would wake up in the morning and walk across the puke-green shag carpeting in my room and I would run four blocks to Bedlam Public Library. I practically lived there. By the time I graduated high school, I still did, I suppose. Not long after that I started working there; I became a librarian. As I was locking up one night, Sid and Nancy were loitering on the ramp that led from the west entrance to the parking lot. They never really came into the library so much as they just hung around outside of it. None of us knew their real names so we just called them Sid and Nancy- on account of Harriet claiming to have seen them shooting up one night. We didn’t put much stock into the things Harriet said but… it was tempting to believe her this once and allow ourselves to become lost in the gossip. Sid hit Nancy and she fell off her perch. It was only a three foot drop but she landed on her arm and started howling in pain. I dropped beside her and tried to calm her down. I offered to help her inside and said I would call an ambulance… but Sid wouldn’t have it. He was paranoid that they would test them; they would find out what they had been taking and the police would be called in. Nancy was still crying out in pain; her arm was obviously broken. I implored Sid to let me call for help and he jumped down, pulled out his gun and shot me in the thigh. In Bedlam, most don’t question mysterious gunshots in the night. Still, Cid was paranoid and he fled at the sight of my body sagging to the ground beside Nancy. Paramedics found me hours later and deduced that Nancy had tried to save my life. Around my thigh was the sleeves of her flannel shirt, fashioned into a tourniquet to stop the flow of blood. Why she had abandoned me after that, no one knows. Maybe Cid came back for her; maybe she left to get help for herself and had forgotten me. All that is known is that her attempt at saving my life had killed the tissue in my leg and amputation would be necessary. I remember lying in a hospital bed and looking at the man I shared my room with. He slept peacefully, nestled into the embrace of get well cards and balloons from his friends and family. I had no friends. My only living family was my mother and her new husband, Ted. I was twenty-two-years-old and I have never even kissed a girl. I had never scored the winning goal. I had lived for my books- my stories… and I couldn’t help but wonder where I would have been had it not been for them? Four years later… and here I am, sitting on a roof and staring down into an alley at Cid and Nancy. They never went back to the library after that night. For four years they’ve believed they killed a man and looking down at them now… hearing Nancy giggle as Cid drunkenly brushes his stubble across her neck… I can’t help but hate them for not feeling more guilty. Finding them was easy… because I had taught myself to read. I can’t explain how it happened: maybe it was the trauma of transfemoral amputation or maybe it was something that I slowly learned to do, having spent so many years pouring over books. Maybe it was the universe’s way of apologizing. After I lost my leg though, I found that I could do something amazing. All I had to do was touch a book or an envelope- anything that contained written information inside of it… and I knew what it said. Better still, I retained it. I dragged my fingertip across the spine of a shelf of encyclopedias and could recall the date Denmark rejected a Prussian-Austrian ultimatum to repel the Danish constitution (January 16, 1864), who the first member of Parliament for any autonomist parties merged in the Lega Nord was (Achille Tramarin), or that tin is produced by reducing the ore with coal in a reverberatory furnace. There are some who would call such a power osmosis but really, I know osmosis to be the diffusion of a solvent through a semipermeable membrane to form a dilute solution. Still, it can also refer to the gradual absorption of knowledge so I suppose it’s a somewhat accurate name to one not versed in hypertonic diffusions. Michuru81 wrote: Here do be Osmosis, a character I'm playing in kipling's Insanity in Bedlam PBP game. I fought for some time on how to represent his power. For a while, I considered creating a Super-Sense for it and then adapting other powers to help represent the effect. In the end, that made me a little too powerful- too much of a deus ex-machina so I went for this build which requires me to be prepared with what skills I'll need (as opposed to having every skill in the book). Of course, we learn that they are actually partners who put on this ruse to nab a second Ring of the Dead. However, Gamma comments that their act was so convincing because they both really were trying to kill each other. Gamma and Smith are supposed to be on the same level… trouble is, while we’re given ample opportunities to see what Gamma can do, we don’t see much out of Smith. While fighting the Falzon family Smith shows an amazing ability to dodge nearly anything. When he begins taking Midge and his fifteen little sisters seriously, Smith moves and suddenly Midge is the only Falzon still standing. In another blink of the eye, Smith puts himself behind Midge and their battle ends. To represent this, we’re letting Rapid Attack work with ranged attacks- allowing Smith to shoot everyone within twenty feet of him and look awesome while he does it.